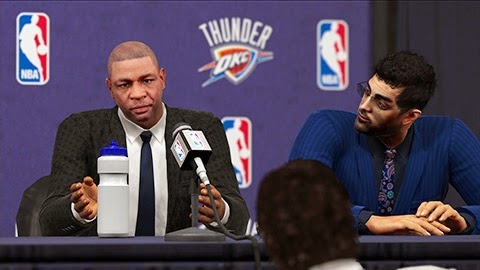 NBA 2K15 got released today and you may have some questions about the game and/or its new mechanics. We've listed some common questions and answers below. How do I activate 2K University? In order to access 2KU, make sure you are connected online. Once you've connected, access NBA Today, then select the sub-menu for 2KU. Can I transfer my VC from one platform to another? No. Players' Virtual Currency (VC) balances cannot be transferred between any version of NBA 2K15, including across console generations. How do I practice moves? There are two ways to practice moves in NBA 2K15. First, during the MyCAREER mode, you will have access to a practice gym in between games. Second, there are also the scrimmage/freeform modes in 2KU which will allow you to practice and run scrimmages. Why does my grade go down when a team member turns over the ball? Something you did was tied to the ball being turned over. Sometimes the foul called is rather generic and doesn’t specify what caused it to occur, at which point you may need to reference the rules of basketball to better understand what happened. What’s a good starting position for a new player? If you're a new to NBA 2K, think about what kind of player you want to be. If you want to score points, having your character play as either a Point Guard or Shooting Guard will probably suit your style. If you think you'd rather have a defensive player, go with Small Forward, Power Forward, or Center. How do I skip cutscenes? In order to skip a cutscene, you have to watch have watched the intro with that profile. After you've watched the intro once with that profile, you can skip a cutscene. How do I check Coach Objectives? There’s no way to manually check the objective goals set by your coach. However, they will be displayed each time you come onto the court to play in the box on the upper right corner of the screen. I just received an objective with a term I don't understand. Help! The Coach Objectives sometimes use terms that might seem a little confusing to someone who isn't deeply familiar with basketball. If you're at all confused, we suggest checking out Wikipedia's excellent glossary of basketball terms to help you better understand the instructions you've received. Where did my Face Scan go? Sorry. If you managed to get an advanced copy of NBA 2K15 before the official launch date and scan your face, things would’ve been reset when the game’s online services went live. You’ll have to re-scan your face now that all online functionality is operational. How do I upgrade MyPLAYER badges? You can view and upgrade your badges by going to the Attribute Upgrades screen and then pressing the appropriate button to view/upgrade badges. I have tattoos. Can I scan and add them to my MyPLAYER character? Unfortunately, no. Unless the tattoo is on your face, there’s no way to scan and add it to your character model. However, tattoos can be purchased and added via the in-game store. Face scanning doesn't seem to work on Xbox One when I start up the game. What's up? The option to scan your face will be enabled in the first update, available October 7th. You must be connected to Xbox Live to receive this update. I don't like the face I've scanned to my player. Can I delete it? Edit your character as you see fit. Select "Complete" when you're done. Welcome to the 2014-2015 basketball season! We will update this post as we receive more questions about the game.